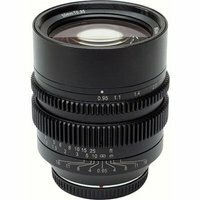 Designed for Micro Four Thirds-fit cameras, the SLR Magic 50mm T0.95 HyperPrime CINE is a high-quality photography and cinematography lens with a field of view equivalent to 100mm in 35mm format. Its 12-bladed aperture delivers beautiful bokeh in de-focused areas, and the aperture ring is decoupled to allow seamless transitions. The focus ring is geared to allow the use of follow focus systems.